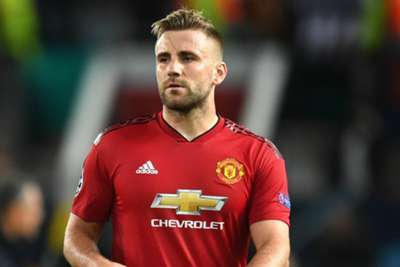 Luke Shaw said Manchester United gave Juventus "too much respect" and "let them play far too easy" as he bemoaned Tuesday's Champions League defeat. United were outclassed in a 1-0 Group H loss to Italian champions Juventus at Old Trafford, where club great Cristiano Ronaldo returned on Tuesday. Paulo Dybala capped a dominant first half for Juve with the 17th-minute opener, and while United managed to stem the tide in the second 45, the Red Devils were no match for Massimiliano Allegri's visitors. Reflecting on the result, United left-back Shaw provided an honest assessment, telling BT Sport: "I think the first half we gave them too much respect, we let them play far too easy. "In the second half we tried and for some reason again we performed better in the second half, we pushed on but didn't create many chances. Like I said we gave them too much respect. "We trained for them, we knew what was coming, in the first half we gave them too much time on the ball we should have been pressing higher. At least Valencia didn't win, now we have to go to Juventus and get a result." United defender Victor Lindelof was one of the team's better performers against Juventus, earning praise from manager Jose Mourinho. Lindelof lamented another slaw start after United rallied from 1-0 down at half-time to draw 2-2 at Chelsea in the Premier League last week, while the Manchester side overturned a two-goal deficit to beat Newcastle United prior to the international break. "I think we deserved more than to lose," Lindelof told BT Sport. "In the last couple of games, we played really well in the second half, we have to start the games the way we were in the second half. "The way we played in the second half, we can take that to Juve. We know they are a great team but the way we were in the second half we need to do more often."